BACKTIME: You Know How I Know That You're Gay? You Know How I Know That You're Gay? Because you would have just landed a Million Dollar payday. Many wondered when the former Gator star, the 2-Time SEC Player of the Year would break through. Today was Brian Gay's day. He's floated around the top of the leaderboard on many occasions, but mostly on Fridays and Saturdays. 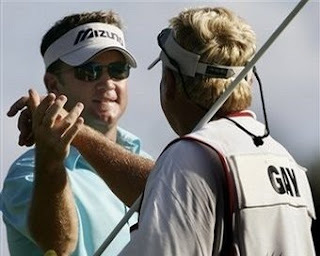 Twenty-six career Top 10s, but only one prior PGA victory - that was in Mexico, a minor event when the world's best are playing the WGC Matchplay event. Gay had never been a closer, until today. He blew away a strong field in Hilton Head with a 64, setting tournament records for best overall score (-20) and margin of victory (10 strokes). Now 37 years old, he has redefined his career. Start looking out for him at the Majors. He just got his first Masters invite - for 2010. 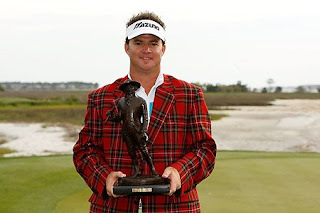 Maybe one day he'll take home a green jacket to add to the champion's blazer from the Verizon Heritage.